Denny Jump (Bellevue, WA, United States) on 22 September 2011 in Lifestyle & Culture. Here, Amy demonstrates the way Juice is extracted from apples through these old style hand turners. Working that crank with apples thrown into the bin is not an easy chore...As the apples are crushed and smashed by the (not visible) crusher in the top square bin, the juice and "apple smush" (as I call it) drops down into the round barrel. From there (and for demonstration purposes) in this case, the juice flowed via a plastic tube into the small white plastic pitcher that you see at the bottom. The Orchard has a little shop (I will show that in a few days) which sells this apple juice (extracted via larger, faster, and more modern crushers) as well as all kinds of other apples and apple-related products ;-) And I am here to tell you, that juice is absolutely fantastic! I bet that juice was wonderful, I bet the kids loved it too, Amy is doing a great job. I can taste it Denny! I marvel at the people who invented the equipment, so clever. Teaching is a very practical, hands on kinda way. @Richard: Hi Richard. You are so right, some of these old "inventions" were really amazing in their ingenuity...shocking almost to we arrogant "modern timers!" Thanks very much..just a few more days of this business and then i wil be on to something else...And back to a 3 or 4 shot a week basis. Merci Beaucoup, Monsiour! Splendid documentary shot, Denny. I can taste that delicious fresh apple juice! @Stephen: Thank yuo Stephen ;-) I Love those dragon boats today1 A great shot, sir! @Eric Cousineau: Sounds like a good idea, Eric! Thanks very much, sir! Happy Birthday to Georgie! Nice setting for this shot and fresh apple juice ... must be delicious! Wow, could you imagine having to do that all day? Guess you'd certainly have some muscles built up in the arms. Wonderful docushot of your daughter Denny! It's great to see this old fashioned way of extracting apple juice. Nice action shot. I'd like a glass of the juice please. @Don: It certainly is - The juic is "dee-lish" Thasnk DOn! A great informative documentary post, Denny. Hard work to get real flavor. I am currently enjoying (this week) a carton of apple juice that is done the old-school way, with cloudy natural appearance and nothing but pure juice taste. Cheers to Amy, and a big cheers to YOU for surviving the lingerie shop. What a wonderful lesson for the children ... as they learn apple juice doesn't automatically come in a glass bottle! You might appreciate an even earlier style apple press that we saw in No. Georgia! Wonderful image, Denny. It has the "flavor" of older. more traditional times. The explanations are great. Do they make cider? It seems the perfect place. Beautiful image. That looks like hard work! Great explanation that you provided. I can just taste it and it so reminds me of Fall! Such a neat contraption to show the kids how easy it is to get juice. Now if only these photo blogs had a scratch and sniff feature! I can smell and taste those apples already. Now if we can just get a photo of Amy baking some apple dumplings! Hmmmmm..
@Steven: Well she makes one hell of an awesom Apple Pie! But dumplings, I am not sure..I will need to ask ;-) Thanks, Steven! looks like alot of work. and thanks for taking the time to give us the story behind it. Wonderful shot and great to see her teaching the kids! Old fashion maybe, but probably much better than the over processed stuff we buy now. Cool shot, Denny. I'm sure the juice from this batch tasted especially sweet...It's great the schools give the kids a chance to see where their food comes from and how it was processed. nothing beats naturally produced and crafted apple juice! nice documentary of an almost lost art! 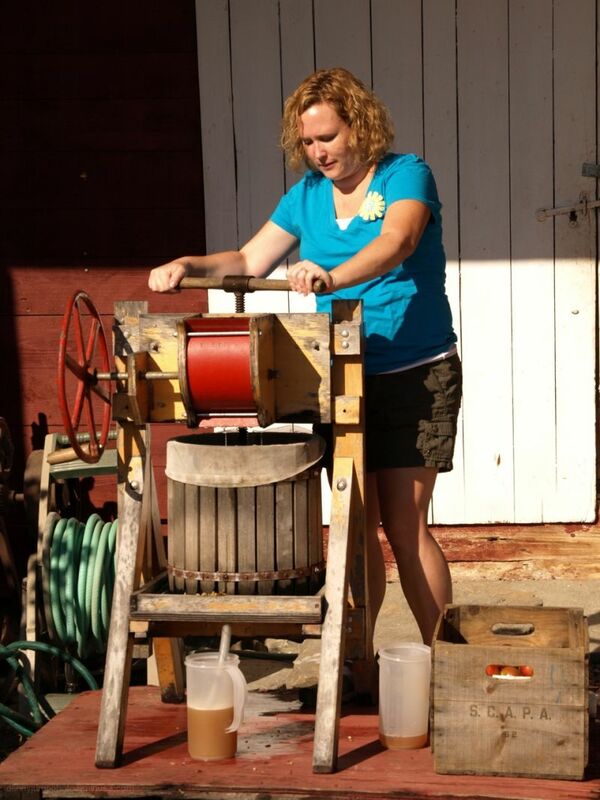 An excellent shot of Amy and the cider press. Looks like hard work-but I'll bet it is really good!